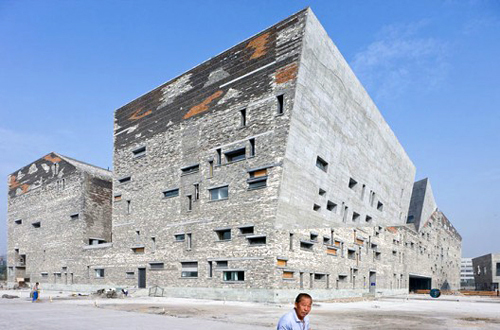 Last month, this year’s Pritzker Prize (architecture’s highest honor) was awarded to Chinese architect Wang Shu. The announcement was surprising for a few reasons. For one, consensus around the architecture blogosphere was that the award would go to a more high-profile architect such as Toyo Ito or Steven Holl, both looked over in recent years. Secondly, assuming that the Pritzker jury intentionally chose a Chinese architect, there were others who could have been considered such as Zhu Pei, Ma Qingyun, or Ma Yansong (perhaps still a bit too young). The Chinese architects mentioned above derive inspiration from China’s ascendancy towards the future, pushing the limits of avant-garde building form. Wang Shu’s architecture, on the other hand, is rooted more in the past, exuding firmness and strength. In this regard, Wang’s architecture is more like last year’s Pritzker winner, Portugal’s Eduardo Souto de Moura, than his Chinese counterparts. Stephen Smith, writing for the International Business Times, posits that the decision by the Pritzker jury was in fact a deliberate political decision. Wang is often critical of China’s breakneck mode of development: razing entire cities to build what Chinese leadership view as a modern expression of urbanity while cities lose their historical character. Western media has been so focused on China’s lack of sensitivity to historical preservation that the mostly Western-comprised Pritzker jury choosing a Chinese architect who is on their side of the debate comes as no surprise. Though in the bigger scheme of things, this is unlikely to have much effect on influencing China’s current urban development blitzkrieg to change course to a slower, more thoughtful model. Taking this into account, this year’s Pritzker decision is no different (or ineffectual) as Chinese activist Liu Xiaobo being awarded 2010’s Nobel Peace Prize.